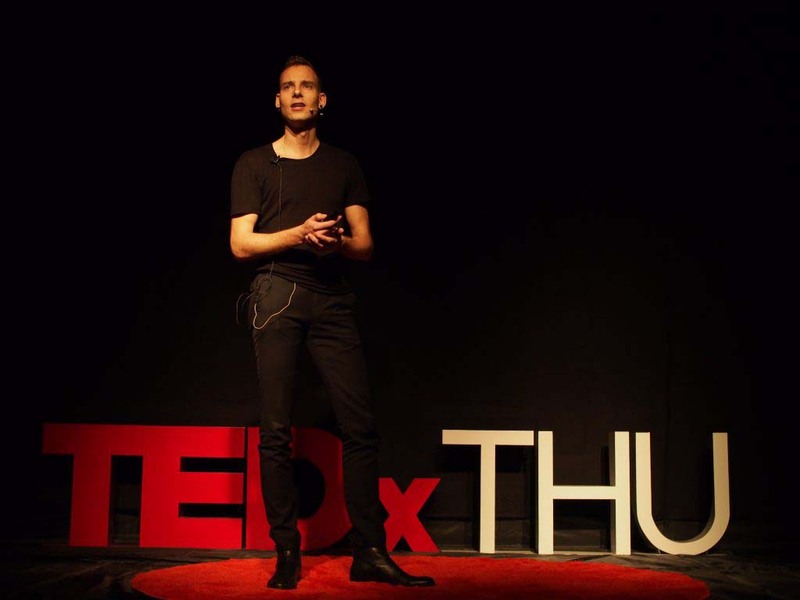 ‘The Girl Who Changed My Life’ was a lecture given my Martijn de Geus at TEDxTHU in 2015. The following text is the transcribed speech. There was somebody in my life that changed my view of things and changed me into the person I am today. This girl I’d like to introduce to you today. We met in my hometown, Apeldoorn, when I was still in high school about fifteen years ago. Her name was Gyasi. In her native language this means wonderful child. I met her at the day she was born about fifteen years ago, at the Zoo I was working. Gyasi is a gorilla. Gyasi was not alone in Apeldoorn, she has a family. This is her mom on the left, Dalila. On the right, Kishiwa, her sister. And this is her father, Bongo. He was not very happy to see me at first, but we got to know each other over the six years I spent together with the family. Or maybe it was just because I was always there to feed them… Anyway, Gyasi was doing very well in the time I was there. This is her about one year after she was born, still with her mom. And she started to learn about the world around her. And she started to go around on the top of her mom exploring the world. She was climbing all over the place exploring new things, and exploring the world around her. And she was also looking at place you were not expecting her to look and see things coming out of there… Indeed very interesting; as a child, we learn, we play and we get to know the world around us. Well, that is very interesting. This is the group of gorillas, Gyasi’s whole family. They’re the biggest and most successful group of gorillas in captivity in the world; up to thirty individuals at a time. So it’s really a big group. And it looks quite natural these trees and all that kind of things. There’s water. But it’s very interesting that Wim Mager came up with the idea of giving animals a place in the zoo so that they we can observe their natural behavior and that they can be the beings that they are in nature and that we can appreciate them for that. So he designed this island over the years. And actually, this islands is very interesting, it works like this. On the top left there is a kind of amphi-theatre, where we can have presentations like here today. On the bottom right there’s a block which is a house where they would sleep when it’s too cold or at nights when there’s nobody around. And the rest of the islands are for them to use during the day. As you can see, there’re lines drawn in the image, and these lines mean different things they mean different elements on the island. The line might be a group of trees to shelter them from the rain. Maybe a wall when they don’t want to see the visitors come to look at them. And there’re also things with dotted lines things you can see through but only if you try very hard. And that’s very interesting what happens with these dotted lines. For example, this is Bongo in the front. And on the top his son, Makula who was living at another island at that time— young guys don’t want to live with their parent anymore so they move to the home next door. And if Makula would climb up to the mountain he could see his father. If he didn’t want that he would just get behind the trees to get out of the way. You don’t want your father to look at you all the time. And they found this is the same for people. I found this architect later, who happens to be a Dutch architect, who designed in the same way for children in schools. You can see these little girls in the front can communicate with the girl in the classroom. But if that girl goes behind the wall she can’t see them anymore and feels more private. The teacher, however, who is a little bit taller, she can still see them through the window. It’s very interesting: if you know about the beings that you design for, if you know about their behavior you can make a place that looks like a home for them. It’s very interesting, I thought. But there was a slight problem. I lived there in Apeldoorn and I worked at the zoo and I saw this and I was happy and the gorillas were happy. However, I found the rest of the world was not quite like that at all. I saw this was what other people were doing to gorillas. People were burning rainforests. People were poaching gorillas. And in other zoos, gorillas were held like this. Left is Berlin. The top right is New York. 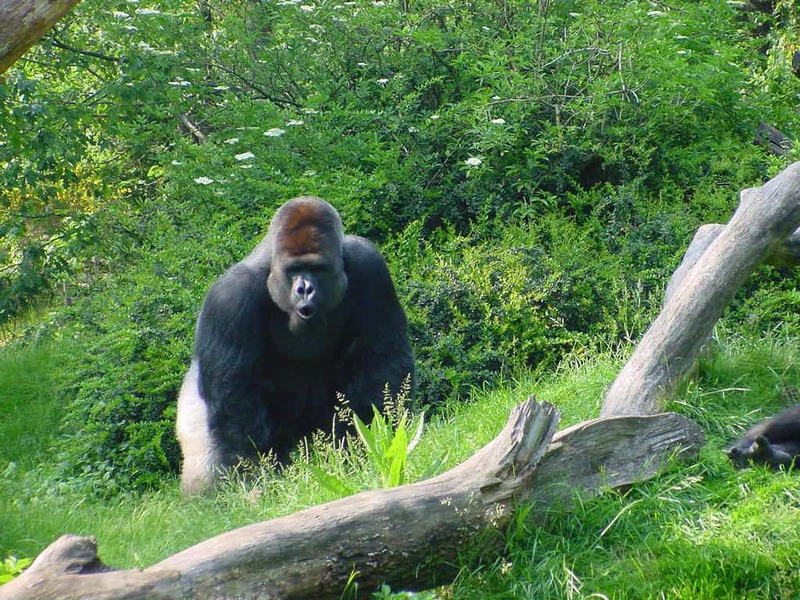 These are our zoos all over the world with gorillas. But even worse than this I found that some cities and some buildings that we put people in are designed just like the worst zoos I could imagine. This is a city. And it’s not a third world country. It’s not so far away. This is Hong Kong. Supposed to be a very developed and rich city. And even worse than the outside appearance, inside those buildings people were housed like this, in cages. It’s worse than the gorillas in my zoo! I mean, what to do? Well, after all this I thought I want to make places for people to enjoy, to feel at home. So I thought I should study architecture. So I went to study architecture in the most famous school in Holland which is TU Delft. And I saw this building where I had to study in, which was very far away from my ideal image of a building. So, after two years’ studying there, there was a small competition to design a building on the campus. And then I designed this little box in front together with my flat mate, Philip. And what I wanted to say with this building is that we don’t need all this kind of dead, concrete, glass, inhumane capsules. We need something that is alive. We need something that changes, that breathes that gives back to the city. So we developed this … this image shows a nice contrast here between our facade which is alive and changing, and the old facade which is concrete and dead. We developed our facade made out of recycled clothes that just uses a little bit of water to grow a large variety of plants. You can see it here when it was just installed. This image shows it a few months later. And a few months later again, during the fall. And actually the prototype of this was developed in my student room because nobody believed that this was possible. So we had to make a mock-up. This was ten years ago (2006). And now you see more of these green facades around. So I think this is something I believed in, and I did. Because I thought if I believe in a better world I should try to make that happen. And what’s very interesting, but also unfortunate, perhaps, is that a few years after I built this little building the other big building burnt down. In Chinese maybe we can call it “缘分” (destiny). I don’t know. Anyway, it happened. So, this strengthened me to believe in what I believed. And I realized, there’s a second lesson. The first is do what you do, a better world starts with you. Secondly, you should be honest. If you think the world should be a certain way then you should also be that way. And then share what you do among each other. And then I came to China six years ago (2010) and I went to Beijing, because I thought I should go to the place where I can make the most impact. Well, if Beijing is like this I thought, surely I can do something there. And as I said, I try to choose the life that I believe in. So I came to Beijing and I saw the cars and saw the pollution and I chose to bike. So I bike, or I use the subway If it’s too cold or too polluted. And I also tried to learn. I learned about China. This is a library in Ningbo. Actually it is the second oldest private library in the world. It’s called Tianyi Ge. And I found this library very interesting. Because I went there and it had no books. There were only trees, and some little houses. And I found that the library over there was meant to recreate an environment which is good for study. 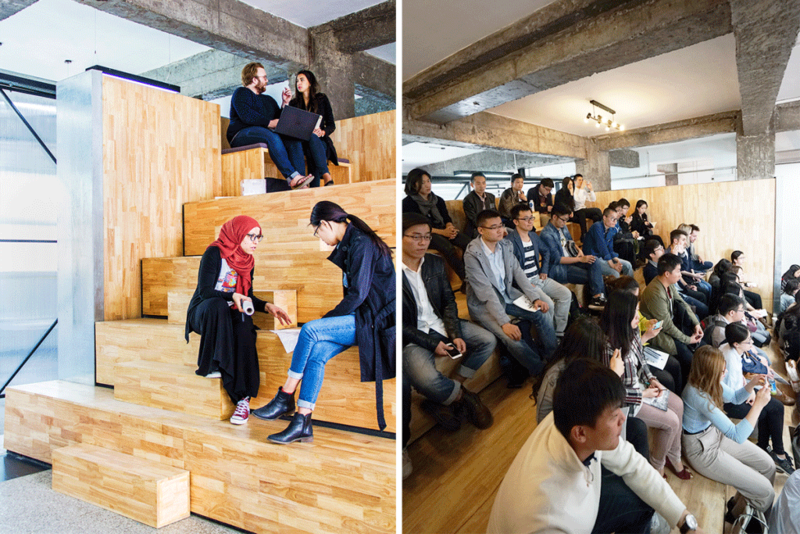 An environment that is natural in which we can relax, we can focus, we can study, we can talk with each other. We can be away from the busy, chaotic world around us. I thought it was a great idea. And I learnt also, that in traditional China, this is a painting from Song Dynasty, people and building were a part of nature. And to study was to be in nature. I thought that’s not bad. So I made this, which you call an urban oasis. Actually you can still see the roofs of the buildings behind that I just showed. So I made a little oasis, a little natural world. Some water, some trees, a waterfall, Buddha, and some birds. I need a cage, otherwise they fly way. I’m sorry. The turtles should be there, also. They’re free and about. This is the view. However, there was still a problem because where I worked, and where I went to go to in China was not quite like that either. 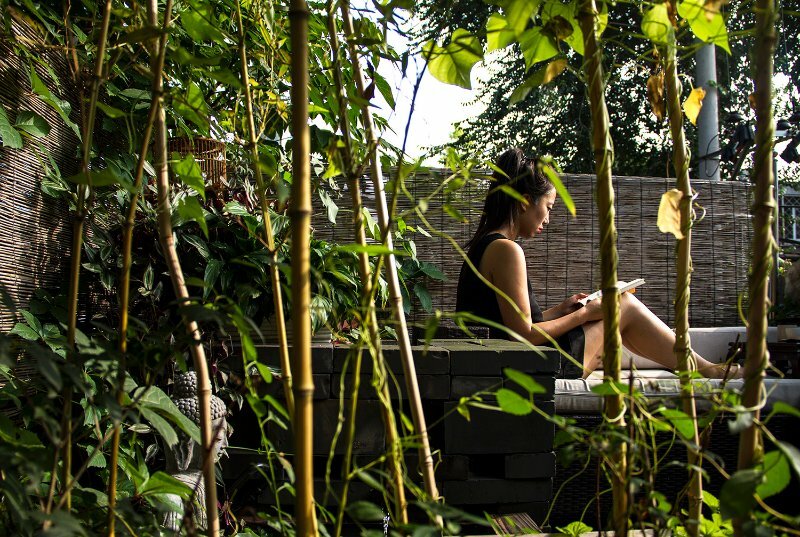 I had made my own little oasis at home, but when I went to Tsinghua University, which is supposed to be the best universities in China, I found this. This is the main building that faces you. It’s like TU Delft. Horrible, big, kind of concrete, kind of somewhat… it didn’t feel good for me. And inside those buildings It looked like this. It’s different from what I had thought. It’s different from talking together. It’s different from collaborative working. It’s different from feeling like a home with a big family. There’s one teacher talking to a lot of students. And where I came to study and where I am working now looked like this. Actually, this comparison is not so far off from the truth because it was inspired by a Russian ideology of buildings. Making everything very standardized, very simple, very bare. But in my mind, that was not very good for a learning environment. Because this is how I learned that people learn. I learned that people and kids like to learn together, they’re naughty, they’d like to explore. Remember Gyasi? Looking everywhere she wasn’t allowed to look. That’s how she learned and people work the same way. So, again, there was a competition for a small project in the architecture school where I was working. They made a competition for all the professors that were part of the architecture school. They could renovate one part of the building. And it was a very small project. But I thought maybe this is interesting to do something. So we were given this one floor to come up with an idea. And I thought, you know what? I’m going to get rid of all the classrooms. I’m going to make it open. And I’m going to put something in the middle that can function like a home base. Something that you can climb on, you can go underneath, you can sit together, you can talk together. And then all around there’s a series of flexible environment that people can reserve one by one, that can connect together, that can open up and you can have it as one kind of home base. Then I won this competition, crazy, they actually allowed me to build this. So I’d like to show how this changed the school from the inside out. At first it was like this. Then we opened it up completely, got everything out. And found it was actually a very nice space. Then we put in this object in the center that you can inhabit, that you can sit on. Even the workers used it during their working time to have a rest. And you don’t have to have the teacher there all the time to control you, because you can just configure it how you want it. This are some images of places that I couldn’t take photos of yet, because it’s almost done now. I think if you go next week the furniture will be there. We even utilized every space that you would not normally think of. We kind of added this floor up in the stairwell, so you can sit when you want to make a phone call or so. We tried to be flexible in terms of using the space and very smart about the environment. For instance here, you can take chairs from the wall to make a small lecture space, if you don’t need them you can put them back. If you can make an effort to make something change in a small way this will balance out the big things in the end. If I was inspired by a little girl to do something and I do something that inspired someone else; if we all work like that, this can really make a big change. So, I like to sum up this idea. I think, and I believe, and I have experienced that a better world starts with you. It doesn’t start with raising awareness, it doesn’t start with inspiring others, it starts with you. Secondly, you have to be honest with yourself about the things you do. The thing you do, is that really what you believe in? Or is that only what you demand from others to do. So therefore, do what you say and share what you do. Thirdly, if we want to go towards this future habitat, then we have to realize that these small changes can have a big effect. And this is something I learnt from working with these amazing creatures. 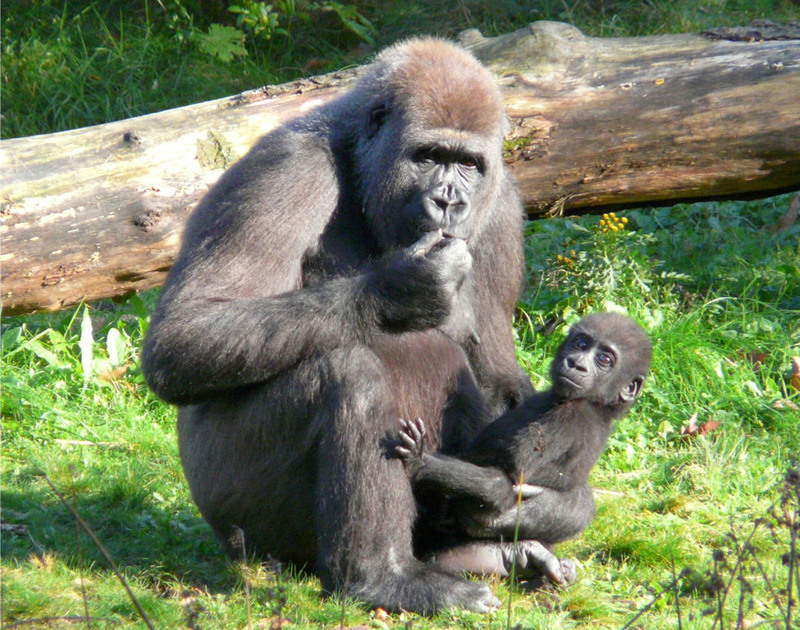 You know this is Gyasi, on the left with her own child now, Tayayi. She was born four years ago. You know Gorillas are a bit faster than me; I’m still here. And what these creatures taught me, what these gorillas taught me, is first of all to be respectful. Be respectful for the world that we inhabit and be respectful for the others around you. You know gorillas are amazing creatures. They’re not aggressive. They eat plants. They are vegetarians. They might look very big and impressive but they’re actually very kind animals. And what I learnt most from them is that they don’t do things for their own ego and for their own benefit. 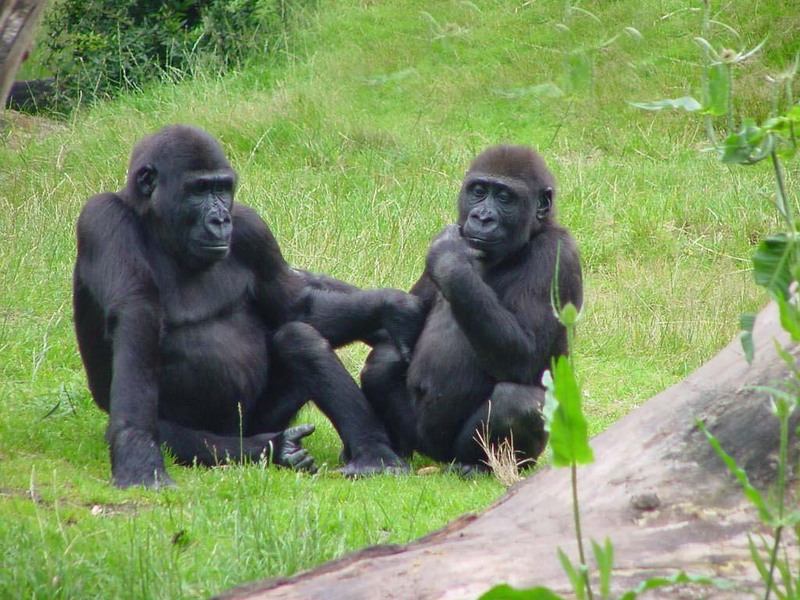 Their leader, Bongo is chosen to be the leader by the women in the group not because he is big or because he is handsome or because he is strong, but because he is able to convince the other gorillas that his decisions are good for the whole group. So I think if we can take a little bit of that to make sure that what we do is not only to satisfy our egos, but is good for the cause of all the people around us and for the world at large, we surely can make a better world.